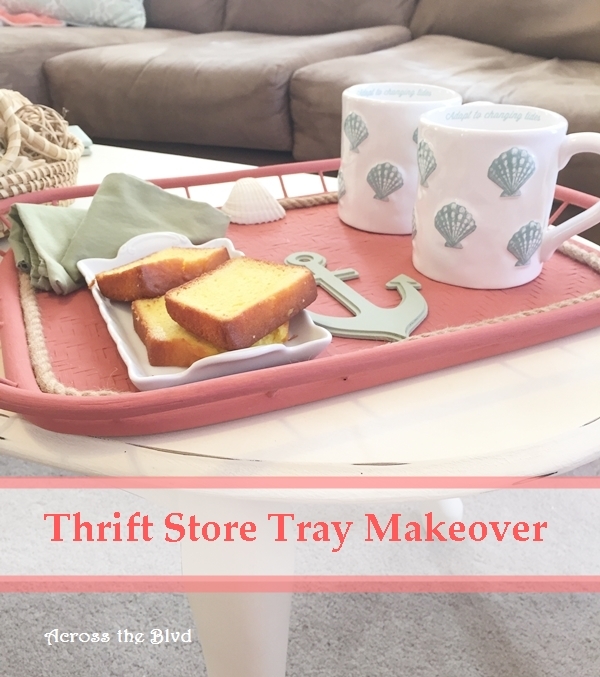 I’m excited to share this easy Thrift Store Find Makeover today. 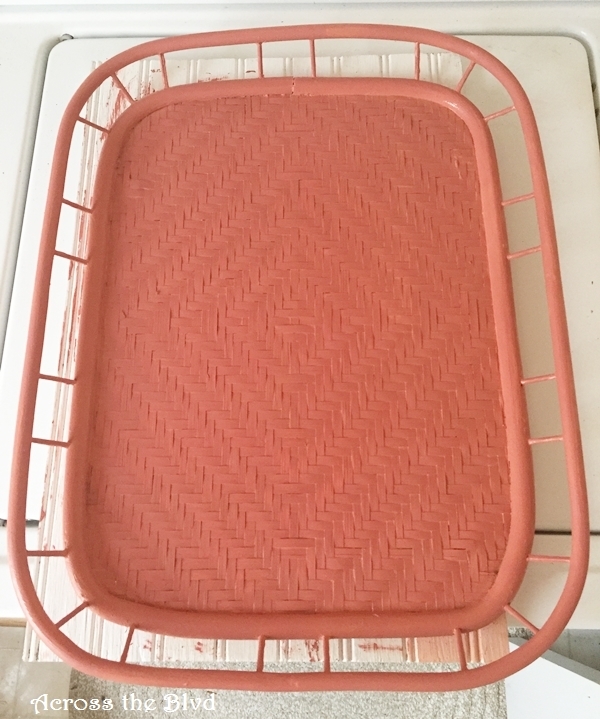 I recently bought a plain tray at Goodwill for .50. I wasn’t sure just what I would do with it, but for that price, I couldn’t pass it up. Once I thought about how to give it a new look, I decided a coastal makeover would be just right for this. The tray wasn’t in bad shape. It just needed to be cleaned up a little. 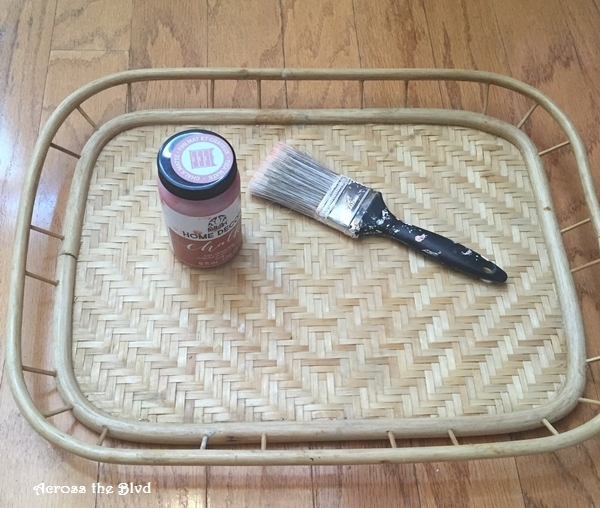 I used the same Salmon Coral Paint from Folk Art that I used for my side table makeover. I’m so impressed with the coverage this paint gives. I still haven’t finished off the jar of paint. 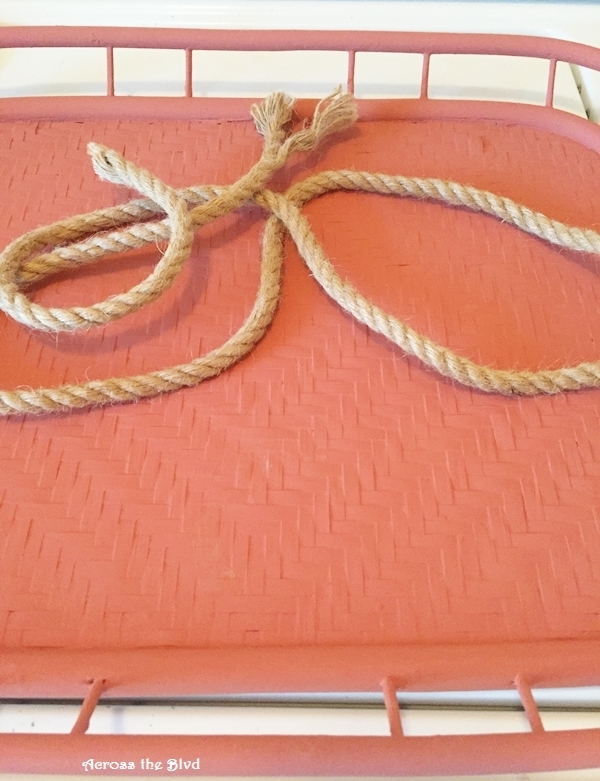 I gave the tray two coats of chalk paint, allowing it to dry between each coat. I went through my craft stash and found that I had more rope leftover from other projects. 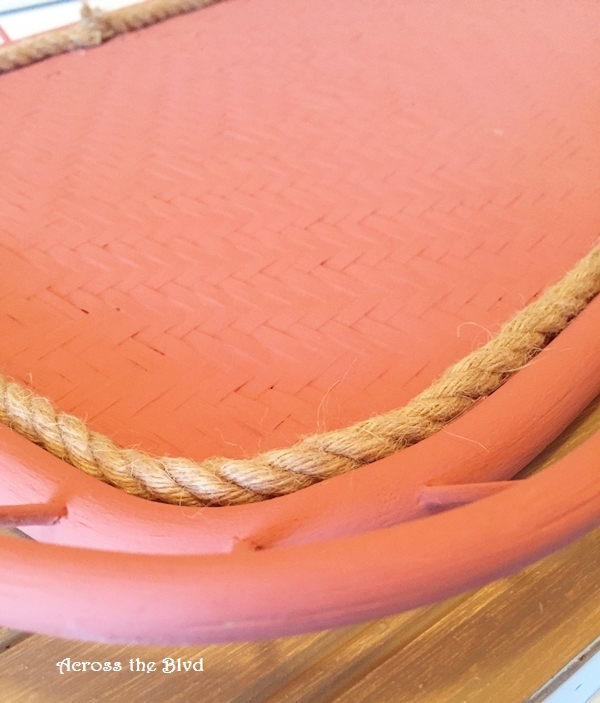 I used it to line the inner rim of the tray, using hot glue to keep it in place. I tried to use an anchor stencil that I’ve used for another thrift store find, but because of the weave pattern, I couldn’t get sharp lines. So, I painted over the stencil and went with plan B. I’ve had this wooden anchor for a while. I used Waverly Chalk paint in Celery that I’ve used on a few other projects. I hot glued it to the tray. 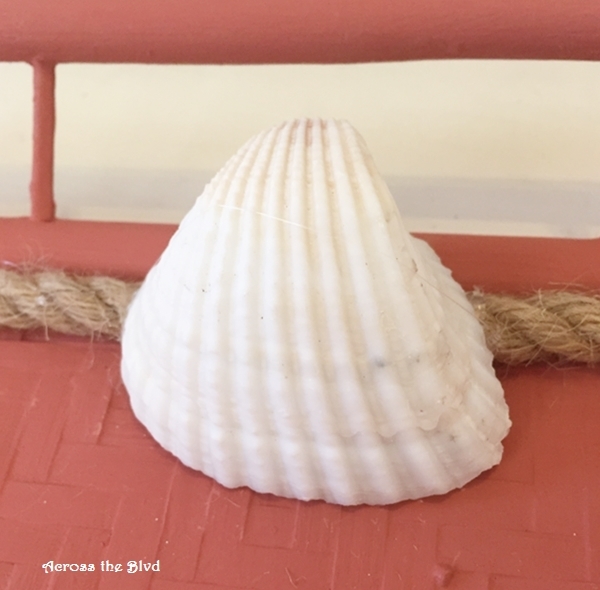 To cover the ends of the rope, I hot glued a shell over the spot where they meet. I’m pretty pleased that I managed to use supplies I already had on hand, so other than the whopping .50 I spent on the tray, there was no new cost. A couple of weeks ago, I was at Kirklands and spotted these great mugs. 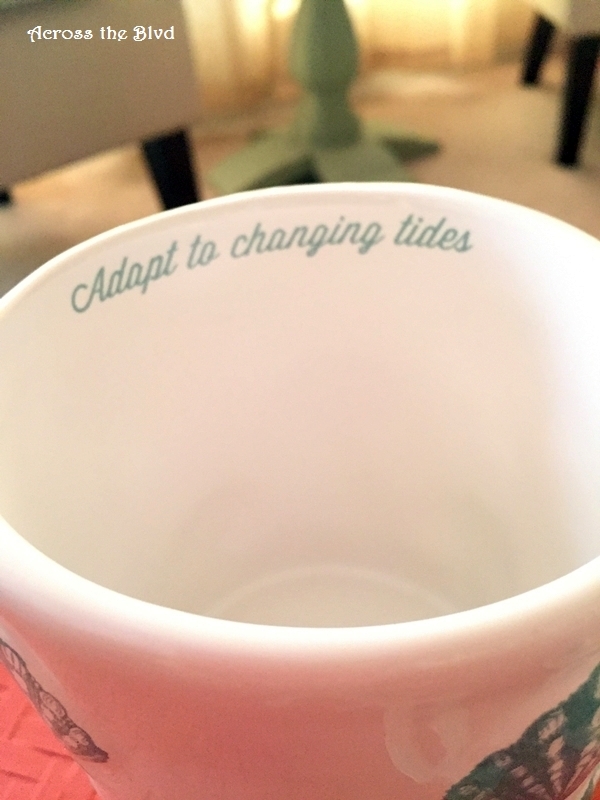 I love the “Adapt to Changing Tides” quote on the inside. 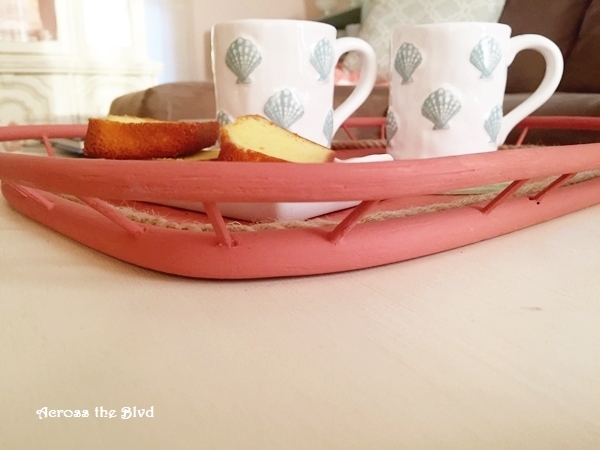 My Coastal Tray makes a perfect serving tray for a couple of cups of coffee and a treat. I love when I find something at a thrift store that I know has potential to fit in with my decor with an easy and inexpensive makeover. What’s your latest thrift store find? This is a great example that reminds me to never overlook some of the simple items that are always plentiful at various thrift stores. Hi Ladies, I love how your tray turned out, every time I go shopping I never do find these, guess I am not looking in the right place! Thank you for dropping by to share your ideas and inspiration on the #OMHGFF this week! Hope you will have a beautiful weekend! Thank you, Karren. These trays seem to be plentiful around here. I was happy to find one that was in good shape. Thanks for the great party! Hope you have a lovely weekend. Thanks, Debbie! I’m always happy to visit your blog. WOW – what an amazing transformation! I love it! I’m visiting from the Happily Homemade & Handcrafted party. Thank you, Angie!So nice of you to stop by! Such a cute idea!. Thanks for sharing with us all. Thank you! I love finding things like this and giving them a quick makeover. You’re very sweet to say that! Hope you have a great week! Beverly, Love what you did with the tray! These types of projects are so fun to see. 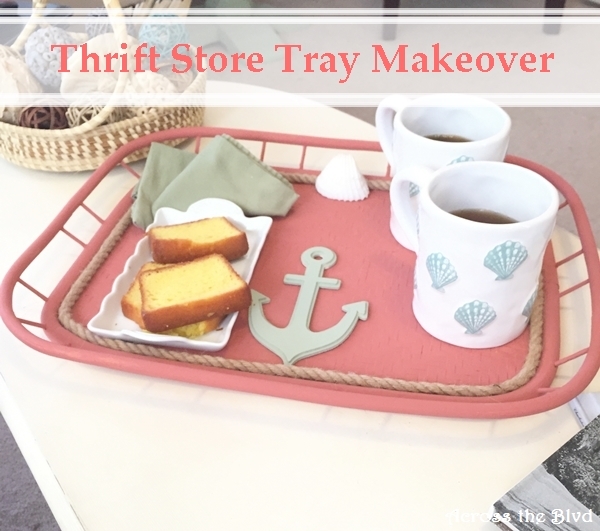 An amazing transformation for a 50 cent tray. 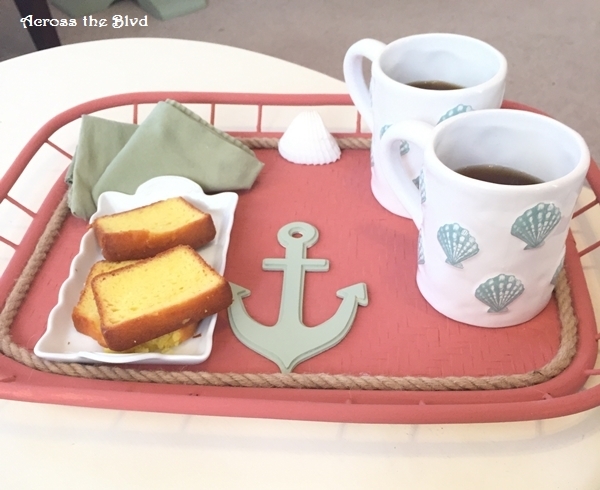 The colors, rope and anchor add such a nice touch and when you put it to use with those adorable mugs and the tasty treat – it looks like a perfect addition to your home! Pinned and tweeted and shared all over 🙂 Hope you are having a wonderful weekend! Thanks, Laurie! They are fun to do, too. So simple and inexpensive for a brand new look. Thank you for the shares! What a difference a little TLC makes. That looks so friendly and inviting to have a coffee. Absolutely. I love finding items like this to freshen up. Thank you, Kathleen. I know, right? Paint is definitely a game changer! I loved those cups the minute I saw them and knew they had to come home with me. I love Kirkland’s for finds like those. Thanks, Millie! Looks great! I love the beachy look! Great for summertime! Magnificent! I never really thought that it just cost you 0.50 cents. I also love it when you paired it with your coffee mugs. The sea shell designs of those mugs fit with the shell you had sticked on your tray. Good job! Thanks so much. It was a great price for the tray. When I bought those mugs, I knew I wanted some kind of tray to go with them. I was happy to have found one I could give a makeover to. A beautiful transformation! I love the color scheme. The rope is a nice touch, too! Thank you, Sherry. Those are some of my favorite colors and I used them a lot in my coastal decor. 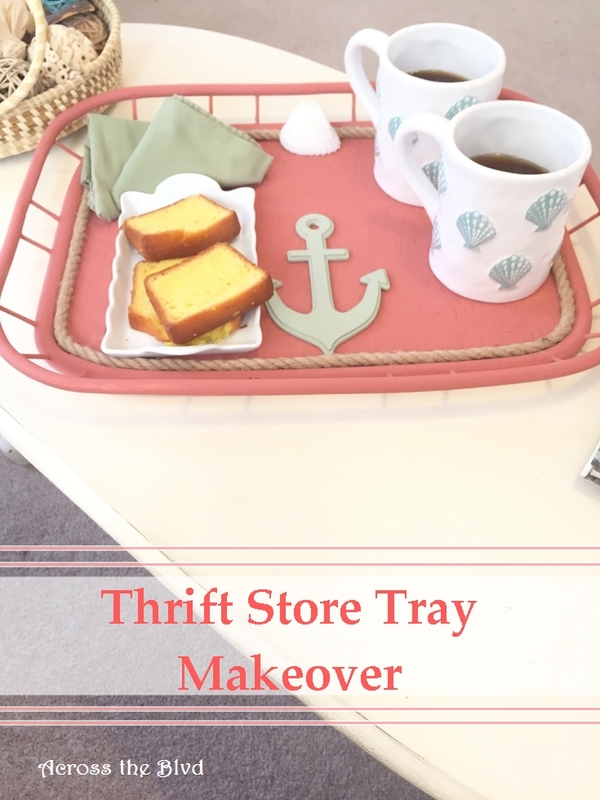 Not only is this a really cute tray, but you could do something like this for an inexpensive and thoughtful gift as well. Thank you for sharing your project with us at the Over the Moon Link Party. Thanks, Sandy! That would be a great idea. Thank you for the great party each week. Oh this is such a neat idea! Thanks, Jess and thanks for the party. 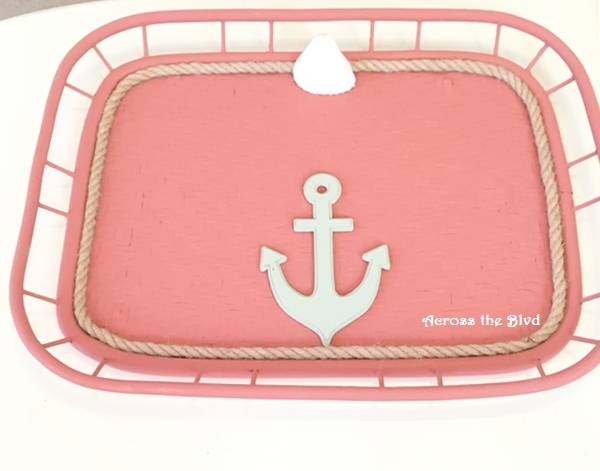 I love everything related to nautical decor, and your tray is so pretty! Love the color and it will match your table makeover. Thanks for sharing with us at #2usestuesday, Beverly! Thank you, Pili. 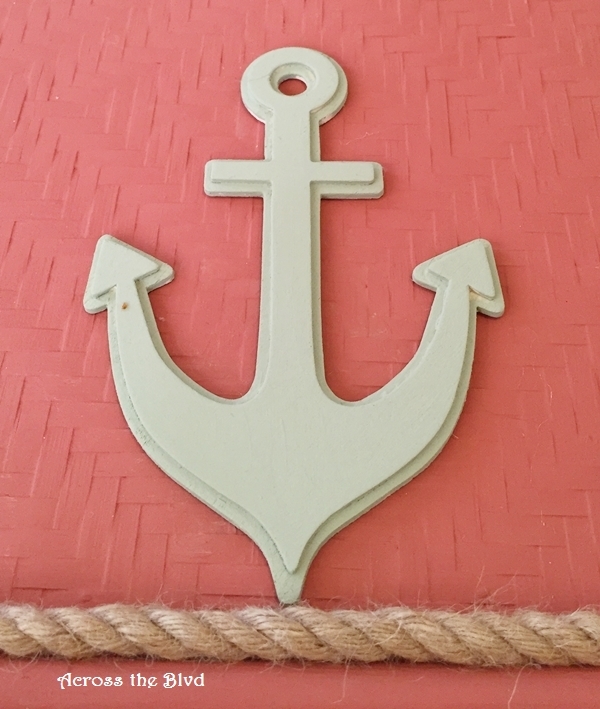 I love nautical decor, too. Thanks for the party and for the visit. Hi again! Stopping by to let you know you are my feature for this week’s party! Congratulations! Thank you, Pili! I’m delighted! Thank you, Laurie. I’ll be looking forward to your creations with your shells! Thanks for the great party each week and for sharing. You made over the tray so nice and pretty! I like the color too! Thank you, Julie. It’s amazing what some paint and a few details can do for a thrift store find. Thanks for the party! Great job! It looks so much better!!! Cute idea! I probably would have passed that tray right by…Thanks for linking with us at Throwback Thursday last week and sorry I didn’t get by earlier to comment! Thanks, Mollie! I appreciate your visits! Thanks for a fun party each week! I love this upcycle!! This looks like something you would buy at the store, I never would have guess this was an upcycle project! This project came out really cute. It’s perfect for breakfast in bed! Thanks! It would be perfect for that! I’m happy to have given you an idea, Wendy! I’d love to see yours if you make one! 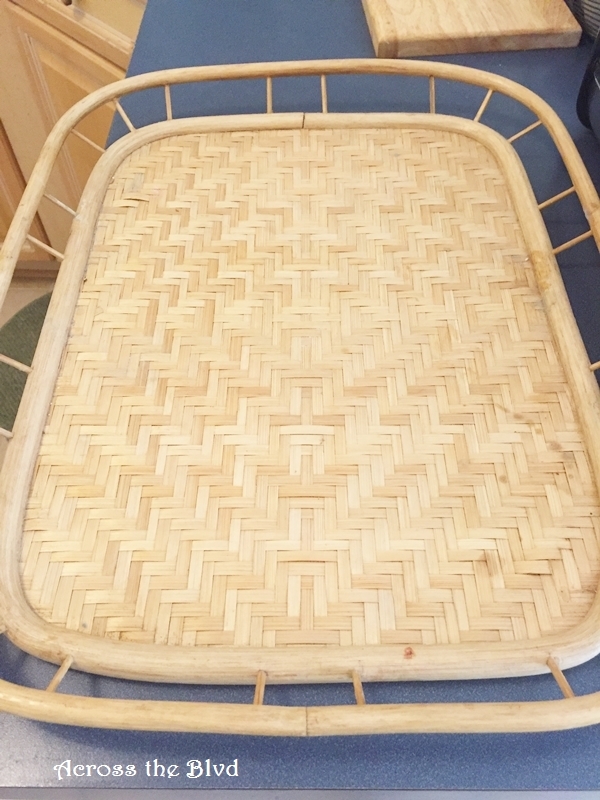 This tray is so pretty, what a great transformation! Thanks for sharing at What’d You Do This Weekend?! Thank you, Joy and thanks for a great party each week.